A growing public sentiment that the brawl in which 74 people were killed in Port Said was deliberately provoked is putting new wind in the sails of militant soccer fan and youth groups who have been battling the military and security forces for much of the past year since the ousting of Egyptian President Hosni Mubarak. As thousands across Egypt joined the youth and soccer groups in protests in the wake of what they see as the planned killing of members of Ultras Ahlawy, the militant soccer fan group of storied Cairo club Al Ahly SC, immediately after the team’s surprising defeat in Port Said by Al Masri SC, the jury of Egyptian public opinion was rendering its verdict on what happened in Port Said with its feet. Ultras Ahlawy together with its arch rival Ultras White Knights (UWK), street-battle hardened supporters of Cairo’s crowned Zamalek SC, played a key role in the protests that led to Mr. Mubarak’s departure. They demanded in violent clashes in recent months the return of the country’s military rulers to their barracks. Much of the youth and soccer groups’ criticism of the post-Mubarak transition rings true even if does not resonate with a majority of the population. They accuse the military of subverting a promised transition to real democracy in a bid to preserve its political and economic perks and interests and employing to do so the same if not worse repressive measures than the Mubarak regime. Scores have been killed in protests since Mubarak’s downfall, thousands injured and some 12,000 people, including activists, bloggers and soccer fans dragged in front of military courts. For much of the past years, the fearless ultras were revered for their militant support for their clubs, their years of confrontation in the stadiums of Mr. Mubarak’s hated police and security forces, and their manning on Cairo’s Tahrir Square of the front lines in January and February of last year during the attacks on protesters by police and Mubarak loyalists. That public support had started to wane however by the time of the vicious street battles in November and December of last year near Tahrir Square in which some 50 people were killed and more than 1,000 wounded. 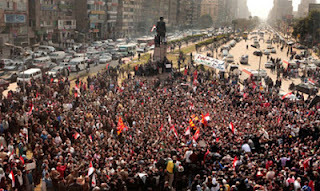 If the deaths in Port Said were intended to further isolate the militant soccer fan and youth groups, circumstantial evidence that the incident was provoked is back firing with the military on the one hand cracking down on demonstrators and on the other hand unsuccessfully seeking to project itself as the protector of football supporters and the independent investigator into what sparked the incident. The evidence that includes Twitter warnings in advance of the match in Port Said; the presence in the stadium of a group of unknown, alleged Al Masri supporters armed with batons and knives; the locking of stadium entrances that usually were open so that people could not escape; and the fact that soccer violence is usually initiated by supporters of the losing rather than the winning team certainly when the winner is a mouse like Al Masri defeating a giant like Al Ahly may not be firm enough to stand up in court. 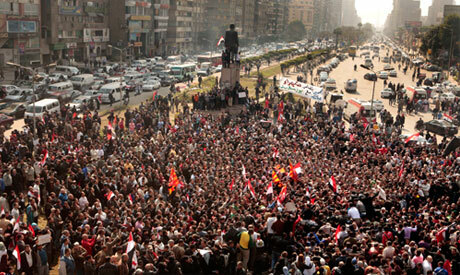 With Egyptians taking to the streets, it doesn’t have to. A statement by the Muslim Brotherhood earlier this week that an “invisible” hand had been involved in Port Said suggested that the group that won the first post-Mubarak parliamentary election was aligning itself with the Egyptian public’s verdict and leveraging the incident in its effort to reduce the role of the military in the transition to democracy. The lack of security in the Port Said stadium “confirms that there is invisible planning that is behind this unjustified massacre. The authorities have been negligent. We fear that some officers are punishing the people for their revolution and for depriving them of their ability to act as tyrants and restricting their privileges," the Brotherhood said in a statement on its website. While it is unlikely that the Brotherhood at this point will join the protests, it has demonstrated in the past that its ability to mobilize people can make or break public manifestations. The deaths in Port Said have left the ultras – modeled on similar groups in Italy and Serbia – who bear a deep-seated hatred of the police because of the violence and the abuse they were exposed to in almost four years of weekly battles in stadiums during soccer seasons angry, ever more determined and eager for a fight. It has also put ultra leaders who were seeking to reign in their ranks swelled over the years by thousands of young, disaffected, often less educated and unemployed fans whose raison d’etre increasingly is revenge. While it has boosted the leaders’ efforts to set aside the deep-seated animosity between the rival ultra groups that in the past year has only been superseded by their opposition to the regime, it has also highlighted their difficulty in controlling their ranks. Theirs is as much a battle for karama or dignity as it is part of the fight to hold the military to its pledge to lead the country to democracy. Their dignity is vested in their ability to stand up to the dakhliya, the interior ministry that is in the wake of Port Said the focal point of the protests; the knowledge that they no longer can be abused by security forces without recourse; and the fact that they no longer have to pay off each and every policemen to stay out of trouble. At the core of the ultras’ defiance is the instinctive learning of the lessons of the failures of Arab revolutionaries in the 1970s and 1980s expressed by prominent Syrian poet Adonis and Marxist ideologue Yasin Al-Hafiz whose calls for leaving no stone in society unturned were stymied by autocratic leaders cloaked in the mantle of Arab nationalism. “Cairo’s Tahrir Square is in a certain sense the paradigm for all the other Tahrir Squares in the Arab world” said prominent Syrian intellectual Sadik Al-Azm in a lecture late last year at the London School of Economics and Political Science (LSE), describing it as resistance to persistent efforts by ancien regimes in the Middle East and North Africa to effectively retain some degree of power. Paradoxically, there is a shared sense between security forces and ultras that for the first time in five years of on-going battles it is the interior ministry security forces as much as the soccer fans fighting for their own survival. The police’s tarnished image as enforcers of a brutal regime remains unchanged a year after Mubarak’s downfall and, if anything, had been reinforced by the military’s refusal to hold police officers accountable for their brutality despite pressure from the public as well as reform-minded security personnel. As a result, the reduced presence of security in the Port Said stadium doesn’t come as a surprise. Amid rising crime rates, police were often absent from the streets and stadiums in the last year more concerned about avoiding clashes that would tarnish their image than in maintaining security and hoping that incidents would prove that they were needed to prevent the country from descending into chaos and anarchy. Amid the tear gas and the smoke on the embattled streets in front of Cairo’s Interior Ministry, ultra leaders were in recent days unsuccessfully trying to gain maximum advantage from renewed public empathy by seeking to limit slogans to events in Port Said. The Guardian quoted an Ultras Ahlawy leader as trying to persuade a militant to remove a sign attacking Egypt’s military rulers. "Take that sign down. We don't want to blame SCAF (Supreme Council of the Armed Forces) today. Politics can wait," the leader said. Ultra leaders have learnt from their failed public relations campaign in the wake of the street battles in November and December that it wouldn’t be that easy to regain public support. Youth activists and soccer fans in the Cairo suburb of Heliopolis erected in December projector screens to show residents looking down from their balconies with little sense of engagement videos of what they see as the military's abuse of power "Why are you silent? Have you won your rights already?" the revolutionaries shouted at them in frustration.